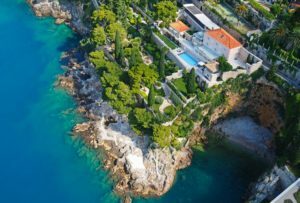 A Croatia villa holiday lets you base yourself in an idyllic location to experience the beautiful Dalmatian coast in style. 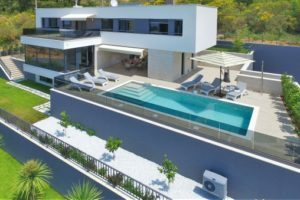 And there are some absolutely gorgeous contemporary Croatia villas popping up all along the Croatian coast at the moment. These inspirational contemporary villas match gorgeous natural surroundings with distinctive modern architecture. Attractive modern designs inspired by their nautical locations have plenty of glass to showcase fantastic views of the Adriatic, wide terraces for admiring sweeping bays and refreshing shapes taken from the natural surroundings and seafaring environment like sails and portholes! Take a look through our portfolio of contemporary villas in Croatia. Some are high end and others at the more affordable end of the price range - but all attractive and wonderfully located for a Croatia holiday. Villa Analisse is a beautiful villa that would suit not only family gatherings but would also work for a business group benefiting from it's own conference room or perhaps a yoga group! Villa Enia is situated in the picturesque village of Splitska on Brac Island and newly renovated in July 2015 and built with traditional stone and eco materials (it is certified with an A+ certificate for energy consumption) - the villa is surrounded by beautiful stone walls. Villa Bougainville, is located just half-way between the centre of Bol and the glorious Zlatni Rat (Golden Horn) beach - the villa is two separate dwellings, each connected by an inner courtyard with a very private swimming pool between them. Villa Desire is set on the outskirts of beautiful Zaton Bay - its location makes a perfect base for a family, or a group of friends celebrating a special occasion. 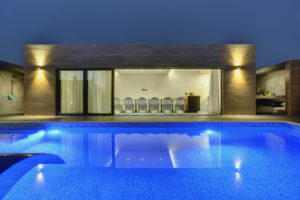 Villa Paradise is beautifully finished with superb pool & views out over the Orasac coast to Dubrovnik's Elafiti Islands. 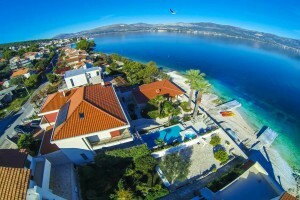 Villa Bianco is situated in a protected bay about 30 minutes drive from Trogir, very close to the town of Primosten, well known for its beautiful old town jutting out into the sea. "The villa was very high spec and the pool area especially was inviting"
This stunning villa has been featured in one of the top Croatian Living publications as one of the most beautiful villas in Croatia - built to a very high specification using beautiful Italian ceramics, Miele kitchen appliances, exotic wood floors etc. Villa Juniper is a gorgeous, stone house within a walk from the sea in the beautiful, calm bay of Orasac - this lovely villa has four double bedrooms all en-suite, each with it’s own private balcony, and a large terrace provides perfect alfresco dining next to the solar heated pool. These modern villas are right by the sea edge and beach just along from a little harbor and little beaches. Villa White Rose is a beautifully furnished house set in a spacious landscaped garden, offering a tranquil setting, yet with plenty of activities should guests wish to keep busy - with the beach a short drive away. These gorgeous new apartments have recently been completed - set in a beautiful bay just outside Pula from where you can catch the ferry to the Brijuni Islands - just stroll down to the beach and the lovely restaurants that the area is famous for. Villa Arymor is a stunning new villa tucked away in a little bay within easy reach of the main beaches and set in lovely gardens featuring an infinity pool, children’s playground and shaded pergola - you have a choice of terrace to relax on & the upper one also has LCD TV and a sound system! In an excellent location in the middle of a lovely suburb of Pula, Villa Julian is still very close to the centre and various facilities such as the local stadium, shops and similar - the villa stands out with its modern design and use of contemporary materials. Villa Francesca is a beautiful well appointed family villa situated in Kastel Luksic bay, offering relaxation in a quiet area. 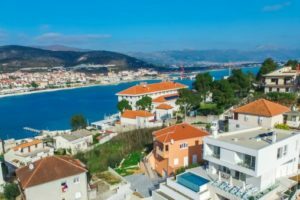 Villa Apartment Select comprises 6 luxury apartments, located 900m from the centre of the historic town of Trogir on the island of Ciovo, and just 20m from a picturesque sandy beach. Villa Light is situated on the island of Ciovo, 300 meters from the Unesco World Heritage site of Trogir Old Town and just 100 meters from the beach - this stunning modern villa with its the terraces around the pool making the most of the morning and evening light, together with a beautiful view of Trogir old town, the beach and amazing summer sunsets. Villa Hermione, in the lovely small fishing village of Banjol, is situated on the peninsula and protected by a natural harbour - it’s now the place to go for people who like to swim, fish and explore - and the surrounding area is very undeveloped and perfect for cycling /walking. Villa Arianna can be found within a huge plot of some 16,000m2, surrounded by olive groves and almond trees, not far from Trogir and with fabulous views over the bay of Kastel to the island of Brac. One of two, newly-built modern villas which are situated in a quiet little bay near Zrnovo, just outside Korcula town. 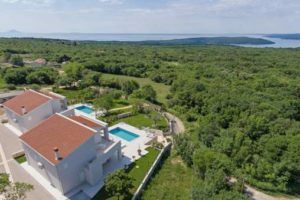 Villa Sweet is a lovely modern four bedroom villa with pool, located in a countryside setting of Labin/Rabac region of eastern Istria, yet just a 5 minute drive to the beach. 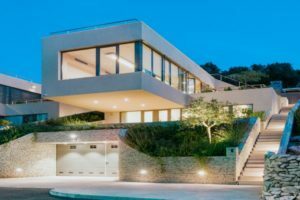 A contemporary Croatia villa in a stunning coastal location is a chance to try out a unique property in a completely different place to your norml day to day surroundings. Kick back and enjoy cutting edge architecture, light and space, mixed with intoxicating gardens and vibrant coastal views. The warmth and buzzing of the cicadas will transport you. 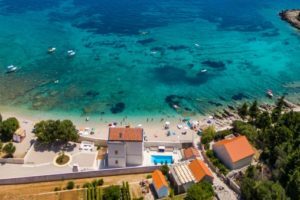 Croatia has been bery protective of its unspoilt coastline, allowing mostly only renovations and rebuilts with very few new buildings or developments allowed. And so the new, comtemporary Croatian villas that have sprung up in the bay along the Adriatic have usually been built where an old house once stood and tend to be in very established and desirable locations with mature gardens and close to little Dalmatian towns, filled with ambiance.